List of users This will display the list of users and provide links to edit and delete them. Also, a link to enable adding new usres will be provided. Add new users This page will provide a form for adding a new user. Edit users This page will provide a form for editing an user. Delete users This page will confirm that we want to delete an user and then delete it. First Create a new folder called “Users” within the “directory zf2/module . Inside the “Users“, create 3 folders: “config“, “src” and “view“. Also create a file called ” Module.php “, and leave it blank for now. 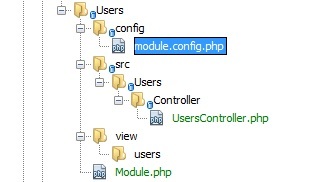 Inside the “src/Users” Create a Folder called “Controller” (Capitalized same, because the namespace), and also create “UsersController.php” file within the “src/Users/Controller” folder. Inside the “view” folder, create another folder called “users” (this lowercase). The name of the route is ‘users’ and has a type of ‘segment’. The segment route allows us to specify placeholders in the URL pattern (route) that will be mapped to named parameters in the matched route. In this case, the route is “/users[/:action][/:id]“ which will match any URL that starts with /users. The next segment will be an optional action name, and then finally the next segment will be mapped to an optional id. The square brackets indicate that a segment is optional. The constraints section allows us to ensure that the characters within a segment are as expected, so we have limited actions to starting with a letter and then subsequent characters only being alphanumeric, underscore or hyphen. We also limit the id to a number. We can now start filling everything in, starting with our database and models. Create a new model for the User class. This needs to be created under src/Users/Model/Users.php. abstract_factories Used to define an array of abstract classes. Used to define an associative array of alias name / target name pairs. Used to define an array of service name / factory class name pairs. The factory classes defined here should either implement Zend/ServiceManager/FactoryInterface or invokable classes. Used to define an array of service name / class name pairs. The classes listed here may be directly instantiated without any constructor arguments. Used to define an array of service name / object pairs. The service is basically an instance of a class. Services can be used to register classes which are already initialized. Used to define an array of service name / Boolean pairs, indicating whether or not a service should be shared. All services are shared by default; this ServiceManager option can be used to disable sharing on specific services. The ServiceManager configuration can be stored either in the application configuration or in the module configuration; this can be chosen according to the needs, application, or module. Now we configure the ServiceManager, we can either supply the name of the class to be instantiated or a factory (closure or callback) that instantiates the object when the ServiceManager needs it. We start by implementing getServiceConfig() to provide a factory that creates an UsersTable. Add this method to the bottom of the Module.php file in module/Users. This method returns an array of factories that are all merged together by the ModuleManager before passing to the ServiceManager. The factory for Users\Model\UsersTable uses the ServiceManager to create an UsersTableGateway to pass to the UsersTable. We also tell the ServiceManager that an UsersTableGateway is created by getting a Zend\Db\Adapter\Adapter (also from the ServiceManager) and using it to create a TableGateway object. The TableGateway is told to use an Users object whenever it creates a new result row. The UsersGateway classes use the prototype pattern for creation of result sets and entities. Now we need to configure the ServiceManager so that it knows how to get a Zend\Db\Adapter\Adapter. This is done using a factory called Zend\Db\Adapter\AdapterServiceFactory which we can configure within the merged config system. Zend Framework 2’s ModuleManager merges all the configuration from each module’s module.config.php file and then merges in the files in config/autoload (*.global.php and then *.local.php files). We’ll add our database configuration information to global.php which you should commit to your version control system. You can use local.php (outside of the VCS) to store the credentials for your database if you want. We can now call getUsersTable() from within our controller whenever we need to interact with our model. If the service locator was configured correctly in Module.php, then we should get an instance of Users\Model\UsersTable when calling getUsersTable(). The first thing we do is to set the title for the page (used in the layout) and also set the title for the <head> section using the headTitle() view helper which will display in the browser’s title bar. We then create a link to add a new users. The url() view helper is provided by Zend Framework 2 and is used to create the links we need. The first parameter to url() is the route name we wish to use for construction of the URL, and the second parameter is an array of all the variables to fit into the placeholders to use. In this case we use our ‘users’ route which is set up to accept two placeholder variables: action and id. We iterate over the $users that we assigned from the controller action. The Zend Framework 2 view system automatically ensures that these variables are extracted into the scope of the view script, so that we don’t have to worry about prefixing them with $this-> as we used to have to do with Zend Framework 1; however you can do so if you wish. We then create a table to display each users’s title and artist, and provide links to allow for editing and deleting the record. A standard foreach: loop is used to iterate over the list of userss, and we use the alternate form using a colon and endforeach; as it is easier to scan than to try and match up braces. Again, the url() view helper is used to create the edit and delete links. Am also getting same issue.